This Jewish Feast of Lights lasts for eight days during mid-December. Part of the celebration includes the retelling of the Hanukkah story. Over two thousand years ago, an army captured the city of Jerusalem. Judah Maccabee led a rebellion against the attackers and reclaimed the city and the temple. The Maccabees wanted to dedicate the temple, but there was only enough oil to light the special lamp for one day. To their amazement, once it was lit, it burned brightly for eight days. When celebrating Hanukkah, the lighting of the menorah symbolizes those eight miraculous days. A menorah holds nine candles. Eight of the candles represent the eight days that the lamp burned in the temple. The servant, or shames candle in the middle, is used to light all of the others. 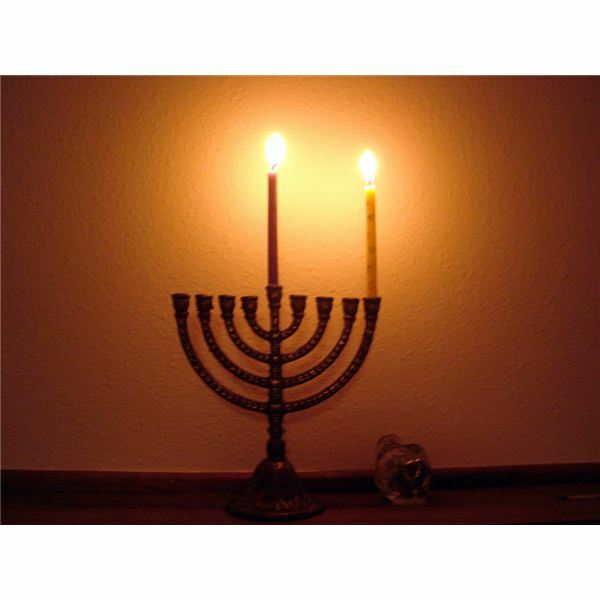 Jewish families hold lighting ceremonies each of the eight evenings. Special foods are served and families sing songs, and entertain each other with riddles, puzzles, and dreidel games. Read to your students the book Potato Pancakes All Around: A Hanukkah Tale by Marilyn Hirsh. In the back of the book, there is a recipe for a traditional Hanukkah food, potato pancakes. Make this treat with your class to sample. A dreidel is a four-sided spinning top with a different Hebrew letter printed on each side. It is believed that the dreidel game goes back to the time of the Greek-Syrians. The Greek-Syrians prohibited the Jews from studying the Torah, and the dreidel served as a decoy. If they saw the Greek-Syrians coming, they would quickly get out their dreidel and hide their books; they then could trick the Syrians into believing that they were just playing a game. All players receive an equal amount of pennies, gelt (chocolate coins), candies, or other tokens. All players put one token in the pot in the center of the playing area. The dreidel is a four-sided spinning top with the four letters explained above. Players take turns spinning the dreidel. At the end of the game, the winner is the one with the most tokens.